In the latter days there will be false prophets and teachers who will teach out of their own hearts and not from the counsel of God. Scripture tells us we can tell the difference if they are of God they would cause the people to hear Gods words and turn them from their evil way. (Jeremiah 23:19-24)…. Behold, a whirlwind of the Lord is gone forth in fury, even a grievous whirlwind: it shall fall grievously upon the head of the wicked. The anger of the Lord shall not return, until he have executed, and till he have performed the thoughts of his heart: in the latter days ye shall consider it perfectly. I have not sent these prophets, yet they ran: I have not spoken to them, yet they prophesied. But if they had stood in my counsel, and had caused my people to hear my words, then they should have turned them from their evil way, and from the evil of their doings. Am I a God at hand, saith the Lord, and not a God afar off? Can any hide himself in secret places that I shall not see him? saith the Lord. Do not I fill heaven and earth? saith the Lord. (Ezekiel’s Commission Chapter 2). In the days leading up to Christ’s return we are told there will be those who will be lovers of self more than of God, so for anyone who does not love God genuinely will stand out and be persecuted. (2 Timothy 3:1-5). 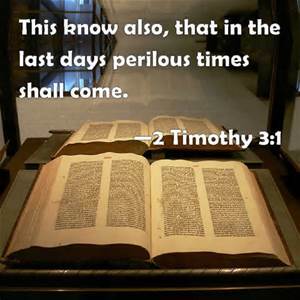 This know also, that in the last days perilous times shall come. For men shall be lovers of their own selves, covetous, boasters, proud, blasphemers, disobedient to parents, unthankful, unholy, Without natural affection, trucebreakers, false accusers, incontinent, fierce, despisers of those that are good, Traitors, heady, highminded, lovers of pleasures more than lovers of God; Having a form of godliness, but denying the power thereof: from such turn away. As Christians we always show forth the word of God dwelling in us.